The escalating cost of cancer care is placing an increasing burden on healthcare systems worldwide, largely a result of expensive biologic therapies. With the patents on many biologics expiring, interest in biosimilars is rising. Biosimilars of biologic agents used for cancer treatment and supportive care are making their appearance in the US; this article therefore aims to increase understanding of the biosimilars concept. Biosimilars are very comparable to their reference products, but because of their size and complexity, are not identical. However, the inherent structural differences between biologics and their reference products may not translate to clinically meaningful differences in efficacy and safety. Biosimilars offer potential cost savings but present a challenge in terms of establishing a regulatory pathway. Regulatory approval requires comparative analytical and clinical studies in order to characterize and demonstrate the absence of clinically meaningful differences between biosimilars and their reference products. Initial approval may not include interchangeability, as additional evidence may be required before a biosimilar can be designated interchangeable with its reference product. A framework for the approval of biosimilars was established by the European Medicines Agency (EMA) in 2006 with the first biosimilar approved in April, 2006. Thus, the experience in Europe provides valuable insights into the use of biosimilars. The widespread use of biosimilars has the potential to reduce healthcare expenditure, as well as improving patient access without compromising patient outcomes, but clinician education and acceptance is crucial. Andrew D Zelenetz has received research support from Genentech/Roche, MEI Pharmaceuticals, BeiGene, BMS, Gilead, and Mirati Pharmaceuticals, and participated in advisory boards/consultancy for Genentech/Roche, Gilead, Celgene, Adaptive Biotechnology, Hospira, and Novartis. The publication of this article was supported by Sandoz. The views and opinions expressed are those of the author and do not necessarily reflect those of Sandoz. 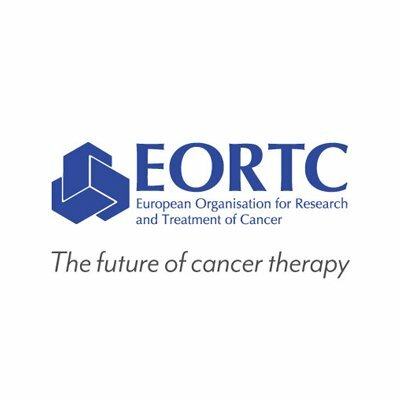 In the past 20 years, recombinant biologics that target specific receptors have made a substantial impact on cancer therapeutics and represent approximately 50% of the pharmaceutical market in oncology.10,11However, these drugs are expensive and are partly responsible for escalating healthcare costs. Year-on-year biologic spending is growing at more than double the rate for small molecule drugs.12In 2010, worldwide sales of all biologics approached the $100 billion mark13and it has been estimated that these could account for more than half of new drug approvals within the next years.14,15However, the patents on biologic therapeutics are beginning to expire (see Figure 1),16allowing the development of biosimilars.17,18Biosimilars represent an opportunity to reduce healthcare spending while increasing access to these important treatments without compromising patient outcomes. Currently, the majority of biosimilar products available for use in oncology are in the supportive care setting; however, their use is increasing rapidly, with an expected shift in focus to agents that offer life-extending benefits, including monoclonal antibodies (mAbs). Biosimilar development programs for therapeutics including bevacizumab, cetuximab, rituximab, and trastuzumab; and supportive care products including epoetin alfa, filgrastim, and pegfilgrastim, are currently ongoing. This article aims to increase understanding of the biosimilars concept, discuss experience with rigorously evaluated and approved biosimilars in Europe, and to evaluate the status of biosimilars in the US, where the Food and Drug Administration (FDA) has recently implemented a regulatory framework for the evaluation and approval of biosimilars leading to the approval of the first biosimilar in the US. An important concept in the manufacture of biologics is variability or post-market changes to a biologic product due to small changes in manufacturing. Biologic therapies are sensitive to manufacturing, storage, and handling conditions and thus have inherent variability, even between batches of the same product. Over the life of a biologic therapy, changes may be introduced to the manufacturing process to improve yield, alter the scale of production or change the source of the individual components. 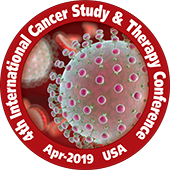 This was demonstrated by analysis of serial batches of biologic agents including darbepoetin, entanercept, and rituximab.20These agents demonstrated minor variations in structure and function. In the example of rituximab, serial batches demonstrated changes in antibody-dependent cell-mediated cytotoxicity (ADCC), which is felt to be a central mechanism in the action of rituximab.21 Variability in biologics is an inevitable consequence of production using biologic systems; these changes are regulated by the International Conference on Harmonisation (ICH) Q5E guidelines that evaluate critical control points in the manufacturing process as well as analytical procedures to evaluate potential differences.22 These guidelines dictate the use of sensitive analytics that are necessary to identify any potentially meaningful differences in the manufacture of a biologic medicine. However, guidelines are not intended to prevent changes over time, rather to ensure that any changes do not alter safety or efficacy. Minor differences have emerged in originator biologic medicine that have been accepted by regulatory agencies. This is a key point to understand in the development of biosimilars for biologic medicines. In the US, the Drug Price Competition and Patent Term Restoration Act, also known as the Hatch-Waxman Act, was passed in 1984. This law permitted the manufacture of generic drugs. However, the Hatch-Waxman Act is not applicable to biologics. The FDA has had limited authority to review and approve biosimilars, and this led to delays in the availability of these agents in the US.32The 2010 Affordable Care Act (ACA) enabled the FDA to develop an approval pathway for biosimilars through an abbreviated review process.33 In 2012, draft guidance documents were released, giving clear, stringent guidelines on the permitted variability. A Biologic License Application (BLA) should be submitted to the FDA seeking approval to market any biologic in the US. There are two different types of BLAs: full, stand-alone BLAs filed for approval of an originator biologic product (351(A)),and abbreviated BLAs filed for approval of a biosimilar product (351(K)). In January 2015, the FDA recommended approval of a biosimilar to filgrastim.34Applications for a number of other biosimilars have been filed. 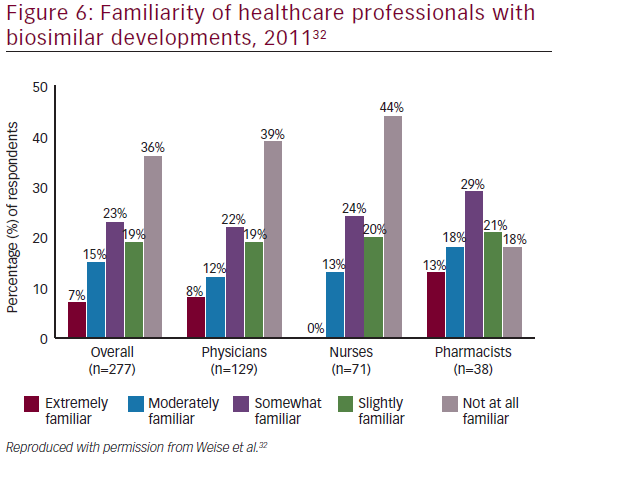 to be not similar are not candidates for further development in the 351(K) biosimilar pathway. 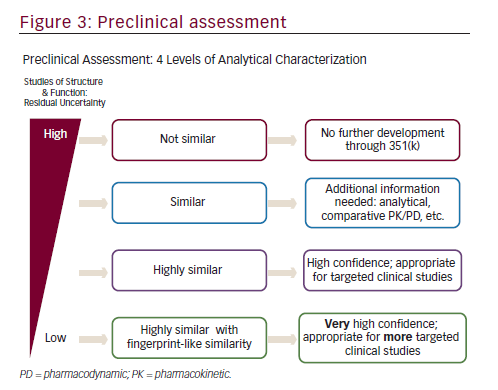 Similar molecules may be required to demonstrate additional pre-clinical analytics as well as a more robust pharmacokinetic (PK) and pharmacodynamic (PD) assessments prior to clinical efficacy evaluation. In contrast, highly similar molecules with fingerprint-like similarity may require only an abbreviated clinical evaluation. A variety of analytical techniques can provide a quality profile on a mAb with more than 100 attributes, including glycosylation, glycation, and higher order structure (see Figure 2).18,24 In addition, a number of biologic assays allow functional testing methods for mAbs.36An example of physicochemical similarity between the originator rituximab and its biosimilar has been published, including primary and higher order structure, post-translational modifications and size variants, as well as an extensive functional characterization package.37Interestingly, in this analysis the biosimilar GP2013 was analytically more similar to US manufactured Rituxan (rituximab; Genentech, Inc., South San Francisco, CA, US) than Rituxan was to European manufactured MabThera (rituximab; Roche Pharma AG, Grenzach-Wyhlen, Germany). Rituxan and MabThera are both approved as the same agent, rituximab. earlier, variations can occur after post-market manufacturing changes. Such variation should be acceptable to regulators and have no impact on the clinical effectiveness or safety of the product.20 A system is in place to ensure that every batch can be tracked. Any parameter for the biosimilar that is outside the known variability of the reference product must be shown to have no impact on the clinical attributes of the final product. Only at this stage can a sponsor conclude that their candidate is ‘highly similar’ to its reference product. Once the pre-clinical evaluation (including comparative animal toxicity if necessary) has demonstrated purity and potency, clinical evaluation can be undertaken.38,39Clinical studies need to include clinical pharmacology studies to demonstrate bioequivalence including assessment of PK or PD (when possible) that are within pre-defined equivalence margins compared to the reference product. Product class-specific PK equivalence will be important to extrapolation decisions that occur later in the development program. Human PD studies should assess measures that are relevant to clinical outcomes; can quickly be assessed with precision and have the sensitivity to detect clinically meaningful differences; and should utilize crossover and parallel designs. An essential aspect of establishing safety is an evaluation of immunogenicity of the biosimilar. This requirement extends into the post-marketing period. Clinical immunogenicity studies evaluate potential differences in the incidence and severity of immune responses using endpoints such as antibody formation (including binding and neutralizing) and cytokine levels.40 Furthermore, a clinical trial must be conducted in an indication approved for the reference product felt to be “most sensitive” to identify differences, if they exist, using an equivalence or non-inferiority trial design. An important aspect of the 351(K) biosimilar approval pathway is extrapolation. Once a molecule has been approved as a biosimilar on the basis of a single trial in the “most sensitive” indication, it is available for all the approved indications of the reference product but must be scientifically justified and considered on a case-by-case basis. 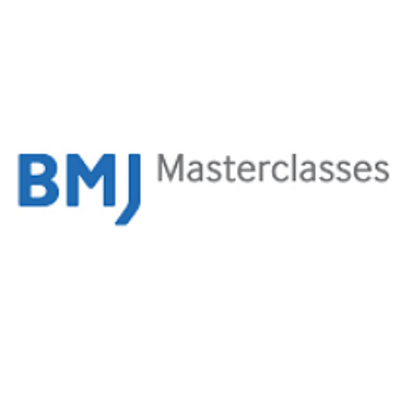 This has raised potential concerns especially when a reference product is used in very different clinical situations. For instance, rituximab is approved for both management of B-cell lymphoma and rheumatoid arthritis (RA). However, the dosing is different in these clinical setting and the extrapolation from RA to lymphoma or lymphoma to RA concerns clinicians. Following the approval of either a biosimilar or a biosimilar that can be used under the status of interchangeability (see below), a pharmacovigilance program must be initiated to ensure the safety and the effectiveness of the biosimilar product, especially during the initial phase of its public use. The same pharmacovigilance requirements apply to the biosimilar as for the reference product.41Post-approval pharmacovigilance monitoring will include patient registries for assessment of safety issues, voluntary, spontaneous reporting of adverse events (AEs) and medication errors to the manufacturer or FDA by healthcare professionals and patients, as well as mandatory AE reporting by manufacturers to the FDA.41Cost-effective pharmacovigilance programs are evolving, including the Sentinel Initiative holding promise. The FDA has also designated a higher standard of biosimilarity, termed interchangeability, requiring data to demonstrate that ‘the biologic product can be expected to produce the same clinical result as the reference product in any given patient and, if the biologic product is administered more than once to an individual, the risk in terms of safety or diminished efficacy of alternating or switching between the use of the biologic product and the reference product is not greater than the risk of using the reference product without such alternation or switch.’38Interchangeability study designs are complex and various designs have been proposed.42Once interchangeability has been established, biosimilars may be substituted at the pharmacy level without the intervention of a healthcare provider.38 However, final FDA guidance on interchangeability is lacking. Individual agents will be evaluated on a case by case basis but in the absence of definitive guidance, designation of a biosimilar as interchangeable is unlikely. Furthermore, if a biosimilar is ultimately deemed to be interchangeable it does not mean that the pharmacists can freely substitute the biosimilar for the reference product. Rules regarding drug substitution are controlled by the states generally through state pharmacy boards. Legislation has already been passed in 18 states that regulate the use of biosimilars with legislation pending in a number of additional states.43 In most cases, pharmacists are required to notify the ordering physician if a substitution of a prescribed biologic is made with a drug that has approval as interchangeable. In most cases there is also a requirement for patient notification of drug substitution. Another area of controversy has been with respect to the naming of biosimilars. Options include: using the same non-proprietary name reference product and any biosimilars; using the same non-proprietary name with a prefix; the same non-proprietary name with a suffix; and using a completely unique non-proprietary names. In the first example of an approved agent in the US, a suffix has been applied to the same non-proprietary name (filgrastim-sndz). However, this is not a final decision. Using the same non-proprietary name communicates the fact that the two products are highly similar. The presence of a prefix may result in failure to identify that the drug was already given by another name, which is also a problem with using a unique non-proprietary name.44,45The white blood cell growth factor Tbo-filgrastim, approved on the 351(A) pathway, using the prefix naming.46The use of a suffix allows for the distinction between reference product and biosimilar and would be grouped together in an electronic health record when sorted by drug name making it clearer what drugs were administered. This issue remains to be resolved. Some of the medical community appear skeptical about biosimilars: initial reports show that physicians are reluctant to switch from the branded infliximab Remicade®(Janssen Biologics B.V., Leiden, The Netherlands) to its biosimilar Inflectra®though there is more willingness to start people on the drug.49Concerns have been expressed among the medical community regarding their efficacy, safety, and impact on reimbursement. One concern is the cost saving they will provide: the cost of developing a biosimilar to reach approval is several orders of magnitude greater than the development of a generic small molecule, largely due to the clinical studies and comparability exercise required to demonstrate biosimilarity. As a result of this investment, cost savings achievable with biosimilars may not be as great as have been experienced with generics.19Concern has been expressed regarding therapeutic indications, for which no specific clinical trials with the biosimilar have been performed and that have been licensed based on extrapolation of efficacy and safety data from other indications.50Strong clinical data will be important for acceptance, and there will be a need for clinician education involving unbiased experts, in the form of national meetings and online education. Using biosimilars in supportive cancer care could allow additional treatments. 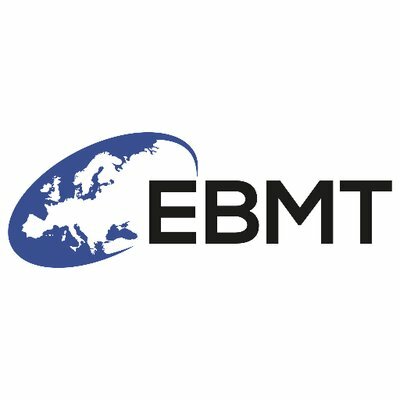 A model estimated that the cost savings associated with switching to biosimilar erythropoietin (EPO) in anemia management in EU countries were €110,592,159, translating into an additional 9,770 rituximab, 3,912 bevacizumab, or 3,713 trastuzumab treatments.54,44The increased affordability of biosimilars may also encourage physicians to adhere more closely to clinical guideline recommendations; in a non-interventional study conducted in a community oncology center, switching from originator to biosimilar filgrastim was accompanied by a trend towards increased use of filgrastim as primary prophylaxis.31 In addition, greater uptake of biosimilars may allow greater funding of research to develop improved biologic cancer treatments. In the US we are facing a crisis in health care spending, and although biologic therapeutics do not represent a large percentage of health expenditure, their escalating price is of concern and limit their use. Biosimilar products offer the potential to reduce costs while increasing access to these therapies. Ultimately, the magnitude of the price saving offered by biosimilars is dependent on the final FDA regulations. Oncologists need a full understanding of the regulatory process in order to make informed decisions about incorporating biosimilars into their clinical practice. When evaluating biosimilars, oncologists should consider a manufacturer’s ability to offer a highly similar, safe and efficacious drug product at a cost saving that will encourage healthcare providers to purchase it in preference to the original product to avoid a forced and undesired switching of a patient’s biologic treatment. Increased awareness of these issues is important as biosimilars become incorporated into clinical practice in the US. 1. American Cancer Society, Cancer Facts and Figures 2014. 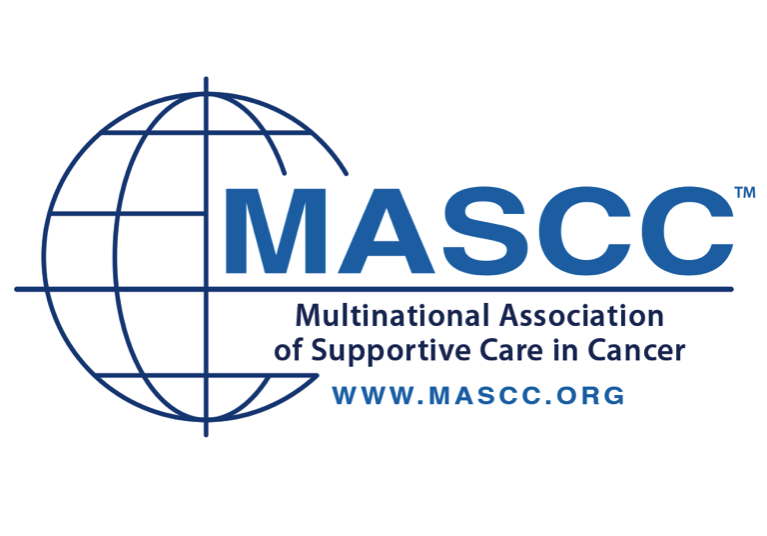 Available at: https://www.cancer.org/acs/groups/content/@ research/documents/webcontent/acspc-042151.pdf. Accessed April 1, 2016. 2. Uyl-de Groot CA, de Groot S, Steenhoek A, The economics of improved cancer survival rates: better outcomes, higher costs, Expert Rev Pharmacoecon Outcomes Res, 2010;10:283–92. 3. Savage P, Mahmoud S, Development and economic trends in cancer therapeutic drugs: a 5-year update 2010–2014, Br J Cancer, 2015;112:1037–41. 4. CMS, National Health Expenditure Projections 2013-2023. Avaialable at: https://www.cms.gov/Research-Statistics- Data-and-Systems/Statistics-Trends-and-Reports/ NationalHealthExpendData/Downloads/proj2014.pdf. Accessed April 1, 2016. 5. Hernandez R, IMS: Global Spending on Medicines to Rise 30% by 2018. Available at: https://www.biopharminternational.com/ ims-global-spending-medicines-rise-30-2018-0?rel=canonical. Accessed April 1, 2016. 6. Fojo T, Grady C, How much is life worth: cetuximab, non-small cell lung cancer, and the $440 billion question, J Natl Cancer Inst, 2009;101:1044–8. 7. Berlinger N, Why clinical oncologists should talk about the price of cancer drugs, Virtual Mentor, 2013;15:677–80. 8. Hillner BE, Smith TJ, Efficacy does not necessarily translate to cost effectiveness: a case study in the challenges associated with 21st-century cancer drug pricing, J Clin Oncol, 2009;27:2111–3. 9. Memorial Sloan kettering Cancer Center. Cost of Cancer Drugs. Available at: https://www.mskcc.org/research/health-policy-outcomes/cost-drugs Accessed April 1, 2016. 10. Mellstedt H, Clinical consideration for biosimilars, Eur J Cancer Suppl, 2013;3(suppl II):1–11. 11. Duffy MJ, The war on cancer: are we winning?, Tumour Biol, 2013;34:1275–84. 12. Mulchany AW, Predmore Z, Mattke S, The Cost Savings Potential of Biosimilar Drugs in the United States, Ramd corporation. Available at https://www.rand.org/content/dam/rand/pubs/perspectives/ PE100/PE127/RAND_PE127.pdf. Accessed April 1, 2016. 13. Walsh G, Biopharmaceutical benchmarks 2010, Nat Biotechnol, 2010;28:917–24. 14. Lawrence S, Billion dollar babies--biotech drugs as blockbusters, Nat Biotechnol, 2007;25:380–2. 15. Erickson BE, Untangling biosimilars, Chem Eng News, 2010;88:25–7. 16. US$67 billion worth of biosimilar patents expiring before 2020. Available at: https://www.gabionline.net/Biosimilars/General/ US-67-billion-worth-of-biosimilar-patents-expiring-before-2020. Accessed April 1, 2016. 17. Dranitsaris G, Amir E, Dorward K, Biosimilars of biological drug therapies: regulatory, clinical and commercial considerations, Drugs, 2011;71:1527–36. 18. 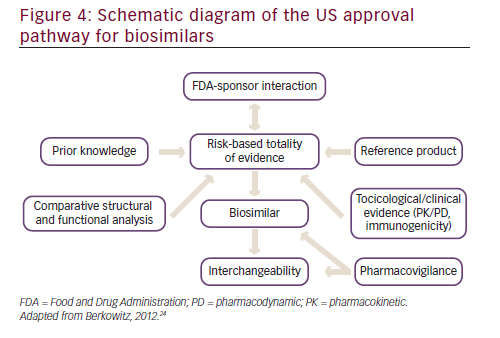 McCamish M, Woollett G, The state of the art in the development of biosimilars, Clin Pharmacol Ther, 2012;91:405–17. 19. Mellstedt H, Niederwieser D, Ludwig H, The challenge of biosimilars, Ann Oncol, 2008;19:411–9. 20. Schiestl M, Stangler T, Torella C, et al., Acceptable changes in quality attributes of glycosylated biopharmaceuticals, Nat Biotechnol, 2011;29:310–2. 21. Clynes RA, Towers TL, Presta LG, et al., Inhibitory Fc receptors modulate in vivo cytotoxicity against tumor targets, Nat Med, 2000;6:443–6. 22. 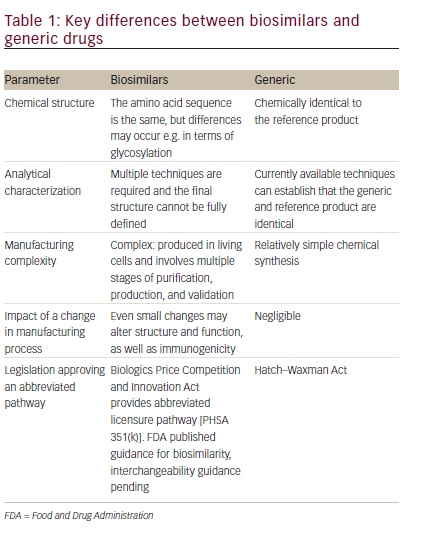 FDA, ICH Q5E: Comparability of Biotechnological/Biological Products Subject to Changes in Their Manufacturing Process. Available at: https://www.fda.gov/OHRMS/DOCKETS/98fr/2004d- 0118-gdl0001.pdf. Accessed April 1, 2016. 23. Weise M, Bielsky MC, De Smet K, et al., Biosimilars-why terminology matters, Nat Biotechnol, 2011;29:690–3. 24. Berkowitz SA, Engen JR, Mazzeo JR, et al., Analytical tools for characterizing biopharmaceuticals and the implications for biosimilars, Nat Rev Drug Discov, 2012;11:527–40. 25. Blackstone EA, Fuhr JP, Jr., Innovation and Competition: Will Biosimilars Succeed? : The creation of an FDA approval pathway for biosimilars is complex and fraught with hazard. Yes, innovation and market competition are at stake. 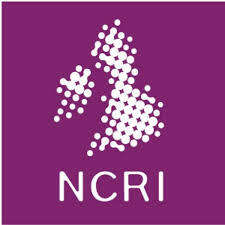 But so are efficacy and patient safety, Biotechnol Healthc, 2012;9:24–7. 26. European Medicines Agency. Guideline on similar biological medicinal products. European Medicines Agency, London, U.K. CHMP/437/04. 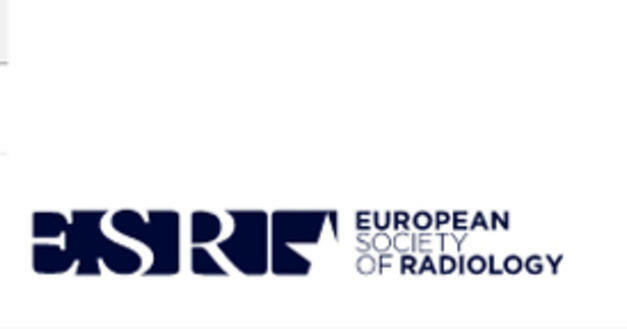 Available at: https://www.ema.europa.eu/ docs/en_GB/document_library/Scientific_guideline/2009/09/ WC500003517.pdf. Accessed April 1, 2016. 27. European Medicines Agency, Omnitrope. Available at: https://www.ema.europa.eu/ema/index.jsp?curl=pages/ medicines/human/medicines/000607/human_med_000946. jsp&mid=WC0b01ac058001d124. Accessed April 1, 2016. 28. European Medicines Agency, Refusal Assessment Report for Alpheon. 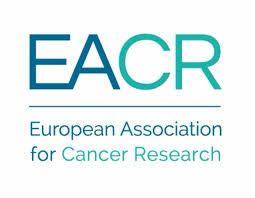 available at: https://www.ema.europa.eu/docs/ en_GB/document_library/EPAR_-_Public_assessment_report/ human/000585/WC500070792.pdf. Accessed April 1, 2016. 29. Ebbers HC, Muenzberg M, Schellekens H, The safety of switching between therapeutic proteins, Expert Opin Biol Ther, 2012;12:1473–85. 30. 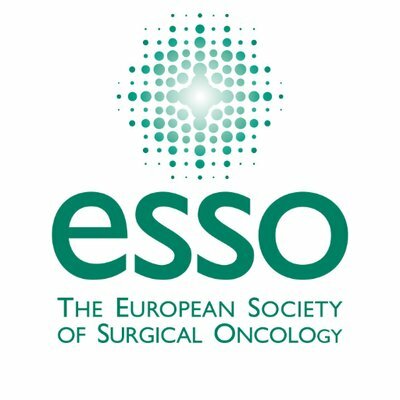 Michallet M, Luporsi E, Soubeyran P, et al., BiOsimilaRs in the management of anaemia secondary to chemotherapy in HaEmatology and Oncology: results of the ORHEO observational study, BMC Cancer, 2014;14:503. 31. Verpoort K, Mohler TM, A non-interventional study of biosimilar granulocyte colony-stimulating factor as prophylaxis for chemotherapy-induced neutropenia in a community oncology centre, Ther Adv Med Oncol, 2012;4:289–93. 32. 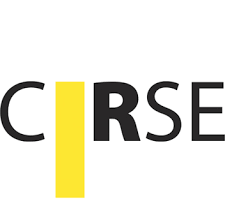 Zelenetz AD, Ahmed I, Braud EL, et al., NCCN Biosimilars White Paper: regulatory, scientific, and patient safety perspectives, J Natl Compr Canc Netw, 2011;9(Suppl 4):S1–22. 33. FDA, Title VII: Improving Access to Innovative Medical Therapies. Subtitle A: Biologic Price Competition and Innovation (BPCIA) Provisions of the Patient Protection and Affordable Care Act (PPACA). Available at: https://www.fda.gov/downloads/Drugs/ GuidanceComplianceRegulatoryInformation/UCM216146.pdf. Accessed April 1, 2016. 34. Novartis, Sandoz biosimilar filgrastim recommended for approval by FDA Oncologic Drugs Advisory Committee. Available at: https://www.sandoz.com/media_center/press_ releases_news/global_news/2014_01_07_Sandoz_biosimilar_ filgrastim_recommended_for_approval_by_FDA_Oncologic_ Drugs_Advisory_Committee.shtml. Accessed April 1, 2016. 35. FDA, Guidance for Industry: Clinical Pharmacology Data to Support a Demonstration of Biosimilarity to a Reference Product, 2014. Available at: https://www.fda.gov/downloads/ Drugs/GuidanceComplianceRegulatoryInformation/Guidances/ UCM397017.pdf. Accessed April 1, 2016. 36. Hulse J, Cox C, In vitro functional testing methods for monoclonal antibody biosimilars, BioProcess International, 2013;11(Suppl 6):24–7. 37. Visser J, Feuerstein I, Stangler T, et al., Physicochemical and functional comparability between the proposed biosimilar rituximab GP2013 and originator rituximab, BioDrugs, 2013;27:495–507. 38. FDA, US Food and Drug Administration. 2012. Guidance for industry: biosimilars: questions and answers regarding implementation of the Biologics Price Competition and Innovation Act of 2009. US Food and Drug Administration, Rockville, MD. Available at: https://www.fda.gov/Drugs/ GuidanceComplianceRegulatoryInformation/Guidances/ ucm259797.html Accessed 19 February 2015. 39. Dranitsaris G, Dorward K, Hatzimichael E, et al., Clinical trial design in biosimilar drug development, Invest New Drugs, 2013;31:479–87. 40. Schellekens H, Biosimilar therapeutics-what do we need to consider?, NDT Plus, 2009;2:i27–i36. 41. Casadevall N, Edwards IR, Felix T, et al., Pharmacovigilance and biosimilars: considerations, needs and challenges, Expert Opin Biol Ther, 2013;13:1039–47. 42. 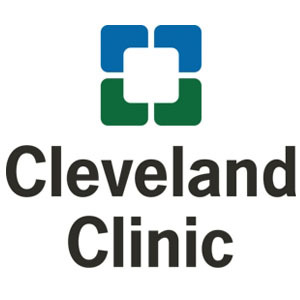 Chow SC, Assessing biosimilarity and interchangeability of biosimilar products, Stat Med, 2013;32:361–3. 43. National Conference of State Legislatures. State laws and legislation related to biologic medications and substitution of biosimilars. Available at: https://www.ncsl.org/research/health/ state-laws-and-legislation-related-to-biologic-medications-andsubstitution- of-biosimilars.aspx. Accessed April 1, 2016. 44. Traynor K, Stakeholders discuss biosimilar naming, substitution, Am J Health Syst Pharm, 2014;71:446–7. 45. Carroll J, Manufacturers square off over naming of biosimilars, Manag Care, 2013;22:6–7. 46. Casadevall N, Felix T, Strober BE, et al., Similar names for similar biologics, BioDrugs, 2014;28:439–44. 47. 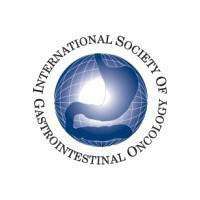 Lammers P, Criscitiello C, Curigliano G, et al., Barriers to the Use of Trastuzumab for HER2+ Breast Cancer and the Potential Impact of Biosimilars: A Physician Survey in the United States and Emerging Markets, Pharmaceuticals (Basel), 2014;7:943–53. 48. 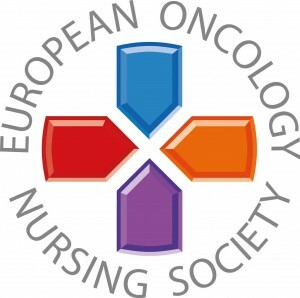 Gunto JB, Revisiting Biosimilars and Molecular Testing in Oncology, NCCN (National Comprehensive Cancer Network) eBulletin newsletter. Available at: https://www.nccn.org/about/news/ ebulletin/ebulletindetail.aspx?ebulletinid=45. Accessed April 1, 2016. 49. Sandberg B, Lessons from the first biosimilar MAb launch in Europe, Pharma & MedTech Business Intelligence. 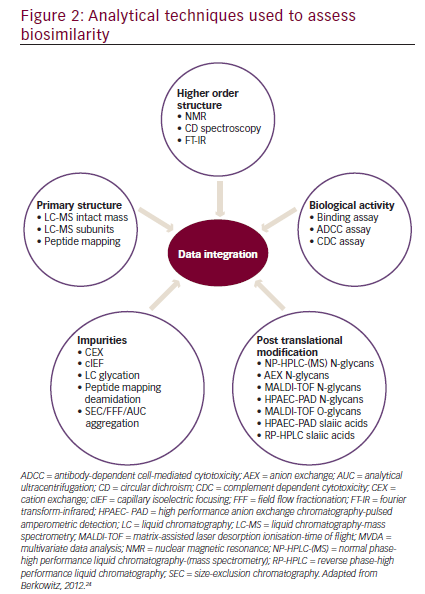 Available at: https://www.triangleinsights.com/pdfs/lessons-from-the-firstbiosimilar- mab-launch-in-europe.pdf. Accessed April 1, 2016. 50. Weise M, Kurki P, Wolff-Holz E, et al., Biosimilars: the science of extrapolation, Blood, 2014;124:3191–6. 51. 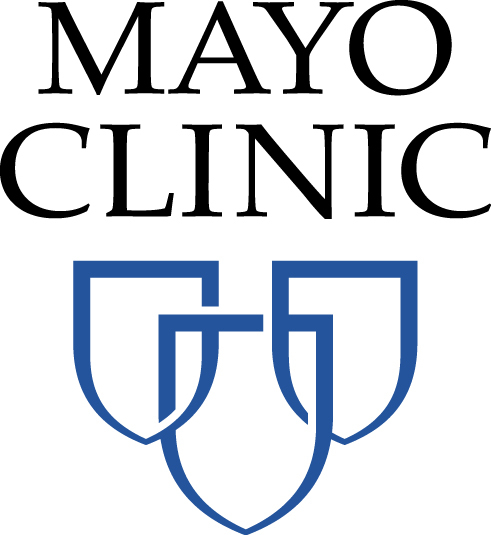 Emerging Health Care Issues: Follow-on Biologic Drug Competition Federal Trade Commission Report June 2009. Available at: https://https://www.ftc.gov/sites/default/files/ documents/reports/emerging-health-care-issues-followbiologic- drug-competition-federal-trade-commission-report/ p083901biologicsreport.pdf . Accessed April 1, 2016. 52. 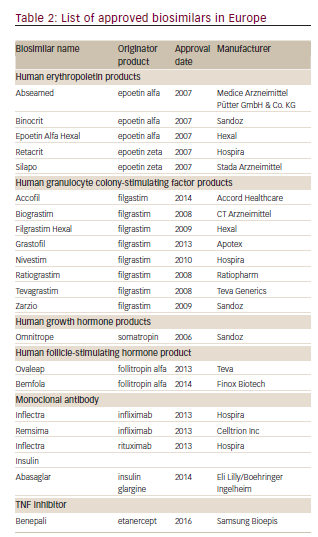 Grabowski H, Guha R, Salgado M, Biosimilar competition: lessons from Europe, Nat Rev Drug Discov, 2014;13:99–100. 53. Aapro M, Biosimilars in oncology: current and future perspectives, GaBI Journal, 2013;2:9193. 54. 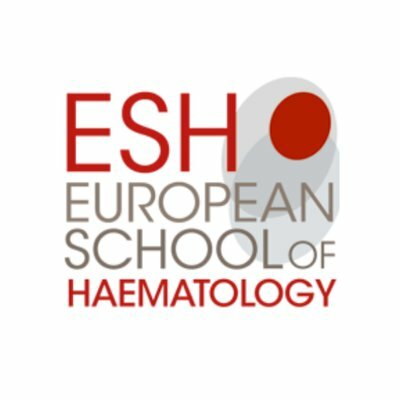 Abraham I, Han L, Sun D, et al., Cost savings from anemia management with biosimilar epoetin alfa and increased access to targeted antineoplastic treatment: a simulation for the EU G5 countries, Future Oncol, 2014;10:1599–609. What Happens when the Cost of Cancer Care Becomes Unsustainable? Can we Continue to Afford Access to Cancer Treatment?